then help is at hand courtesy of the UIPopoverBackgroundView class. 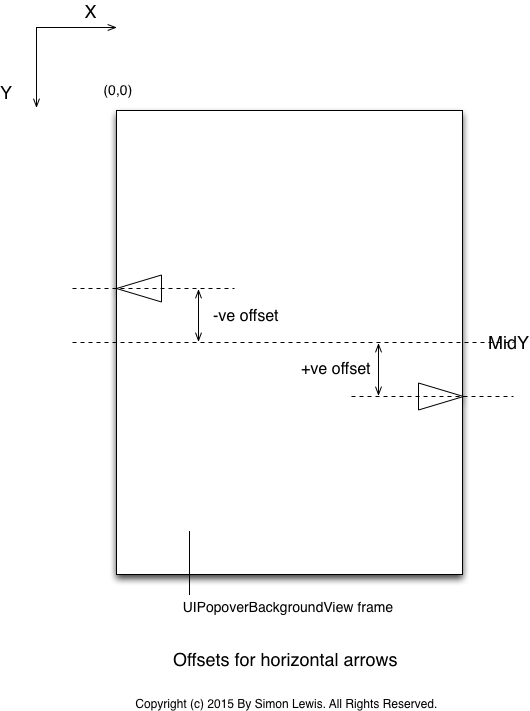 The UIPopoverBackgroundView class defines two properties. The direction in which the popover arrow is pointing. which is entirely obvious unless it is not. The documentation uses a lot of words to explain this. The base of an arrow (see below) must be the same for all directions and it must not change. The height of an arrow (see below) must be the same for all directions and it must not change. This method specifies the distances between the edges of the popover’s content and the edges of the background view’s frame. exclusive of the arrow. 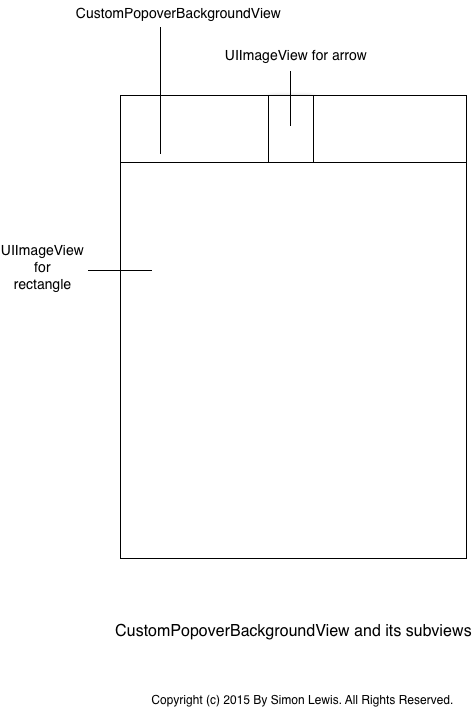 The only way to make use of the UIPopoverBackgroundView class is to sub-class it and override both it properties and the three methods defined by the UIPopoverBackgroundViewMethods protocol. The same holds true for the arrowOffset property. It needs to be overridden by a computed property and we don’t really know what we will need to do. This is a ‘class’ method so there is not a lot of room for manoeuvre, We will will need to return some kind of constant value obtained from somewhere. The same is true for the arrowHeight method. but its really not that exciting. A Direction Digression Or When Is An Enum Not An Enum ? because in Swift UIPopoverArrowDirection is not an enum at all. This is a standard ‘C’ idiom which makes it possible to specify both an arrow direction and a set of arrow directions as values of the ‘type’ UIPopoverArrowDirection. which provides a bit of syntactic sugar, and a little more type safety in that you cannot accidentally pass any old UInt to something expecting a UIPopoverArrowDirection value. Now you have to wrap it in a struct first ! In our case, semantically at least, the API shouldn’t be passing a value that is not equal to one of the static values Up, Down, Left, or Right but as the compiler is making clear there is nothing to stop it doing so programatically, hence the need for a ‘default’ case. The problem with having to deal with a default case is that increases the complexity of the code for no gain whatsoever. Each time we switch on a value of ‘type’ UIPopoverArrowDirection we have to decide what the ‘right thing’ to do is in the default case, even if that thing is nothing. If we change the code containing the switch then the decision needs to be taken once again. If we need to add another switch you need to make the decision again. static func fromPopoverArrowDirection(direction:UIPopoverArrowDirection) -> Direction? For the arrowDirection property, if we are ever handed an ‘invalid’ UIPopoverArrowDirection value we simply drop it on the floor. Its not clear what else we could do. Now we have to provide the ‘background’ for the popover. By default the background is simply an arrow plus a rectangle. 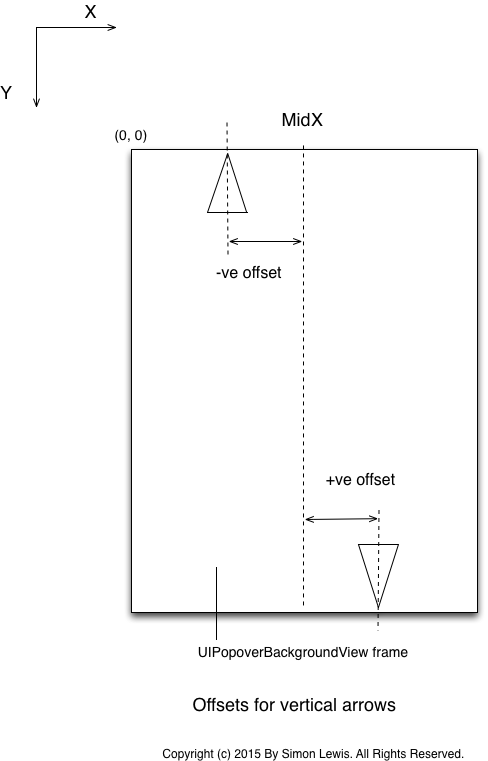 In theory we could draw it but the documentation states that we should use images. The basic task is to work out where the two components of the background should go. 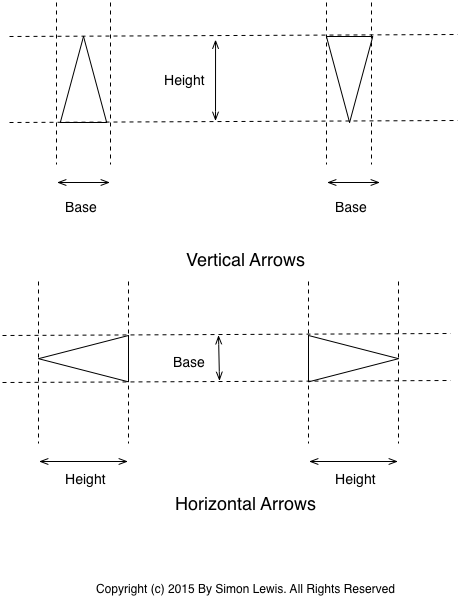 We need to set the frames of the two subviews on the basis of the arrow base and height, and the current values for the arrow’s direction and offset. When the arrow is ‘vertical’ the x coordinate of the origin is the same, and the arrow is either at the ‘top’ if the direction is .UP, or at the bottom if the direction is .DOWN. When the arrow is ‘horizontal’ the y coordinate of the origin is the same and the arrow is on the left if the direction is .LEFT or on the right if the direction is .RIGHT. Since the layout is a function of the current values of the arrow’s direction and offset we need to add calls to the setNeedLayout method each time either of these values change. This ensures that the layoutSubviews method will be called when necessary. 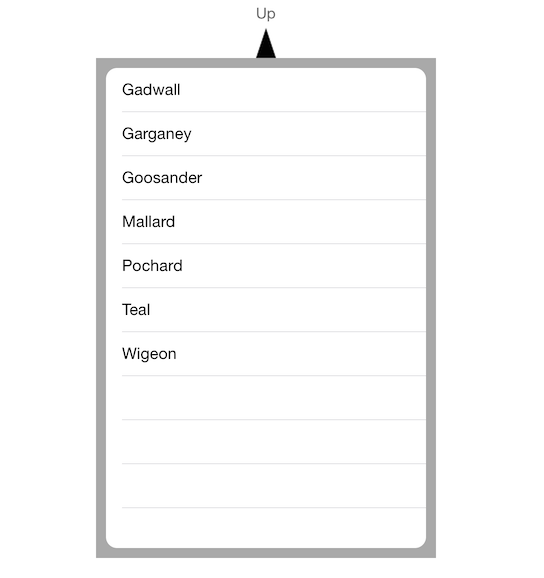 of the UIPopoverPresentationController instance, managing the popover’s display. Note that it is the class itself not an instance of the class which is assigned to the property. 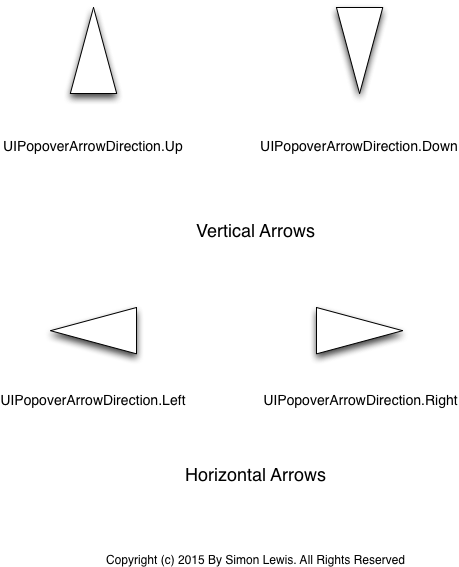 It turns out that no actual drawing of arrows is required at runtime which is a bit disappointing. This is not strictly true, you can draw them, it does appear to work, but you are supposed to use images. You can, if you wish, use a single image and rotate it as necessary. Alternatively, for those of us who do not entirely trust affine transformations, after all how do you know what they are really doing ?, you simply have one image for each direction, which you can of course draw, so all is not lost. Here’s some very simple code for drawing a triangle on Mac OS X.
func drawArrow(width:Int, height:Int, vertices:(CGPoint, CGPoint, CGPoint), colour:NSColor) -> NSData?